Stefan’s films have premiered and won awards at festivals such as Berlin and SxSW, among many others, and have been successfully released theatrically and on TV channels such as PBS, HBO and the Sundance Channel. He has over of 15 feature credits to his name as a writer, director and/or producer, among them MY LAST DAY WITHOUT YOU, Olaf Johannesson’s THE AMAZING TRUTH ABOUT QUEEN RAQUELA, and ARRANGED. On these and other projects he’s worked with Melissa Leo, Ali Larter, Michael Imperioli, Zoe Lister-Jones, Nicole Beharie and many more. 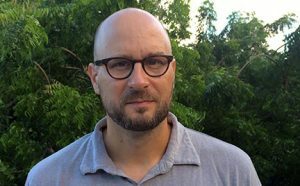 In addition to these indie features, Stefan co-wrote four TV movies for leading European networks ARD and ZDF, two of which filmed in Hawaii. On the documentary front, Stefan’s film EVEN THOUGH THE WHOLE WORLD IS BURNING – about Poet Laureate, two-time Pulitzer winner, and environmental activist W.S. 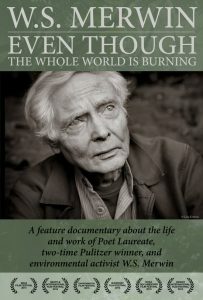 Merwin – was broadcast nationally on PBS in April, 2016. His documentary CONTESTED STREETS – which looks at what New York can learn from London, Paris and Copenhagen in terms of its streets and public spaces – was broadcast as part of the Sundance Channel’s “The Green” series. Stefan has numerous projects in active development, including: a TV pilot/series with Big Beach Films/AMC. He graduated from Wesleyan University, and studied as a Fulbright Scholar in Europe. An active member of the Writers Guild of America (WGA), he’s repped for his film and TV work by LA-based Industry Entertainment. Stefan and his family life on Maui, Hawaii. Now in his 89th year, Merwin has dedicated over three decades to preserving and regenerating native plants and palms on a 19-acre site on the north shore of Maui, Hawaii. Called the Merwin Conservancy, the preserve holds one of the most comprehensive private collections of palms in the world. These tangible actions for the environment go hand-in-hand with his poetry, offering important insights for an era marked by environmental degradation, human disconnect with natural processes, and rapid climate change. A one-hour edit of the film, entitled W.S. MERWIN: TO PLANT A TREE, was broadcast nationally on PBS in April 2016. Learn more about The Merwin Conservancy here.